Trying to find out what kind of beer you like? Continue reading to find out if you’d enjoy a hoppy and bitter beer! Hoppy and bitter brews are becoming a huge trend in the craft beer industry and it seems like every brewery is trying to brew the hoppiest beers they can. Hoppy beers, like a strong IPA, are a required taste and are often referred to flavours such as cilantro — you either love it or you hate it. What are Hoppy & Bitter Beers? Although hoppy and bitter beers use malt as a strong base, it is the hops that come through as the dominant flavour in these brews. The generous addition of hops in the brewing process is what gives these beers their bitterness. Hoppy and bitter brews can range from medium to full-bodied, usually, come out in a golden-yellow to amber-brown colour. It is important to note that just because a beer is considered “hoppy”, doesn’t always mean that it is going to taste bitter. Click here to learn more about the differences between the terms “hoppy” and “bitter”. What are the most popular beers that are hoppy and bitter? With the popularity of hoppy and beers, you’ve probably come across a few but have been afraid to try. Hoppy and bitter brews require a specific palate and not everyone is going to love them. A popular beer that is known for being bitter is Alexander Keith’s India Pale Ale. If you like Alexander Keith’s, you like hoppy and bitter beers! This iconic, Nova Scotia beer is known to be slightly gentle when it comes to bitterness, especially compared to some of the newer craft India Pale Ales on the market today. Alexander Keith’s India Pale Ale offers a soft malt character that shines through the bitterness of the beer. It is balanced with light citrus notes, fully fermented, and is slightly aged to help with the smoothness of the brew. North American hops are used when brewing ‘Keith’s to create a bitter hop flavour with unique malt and floral characteristics. What beer styles are considered “bitter & hoppy”? 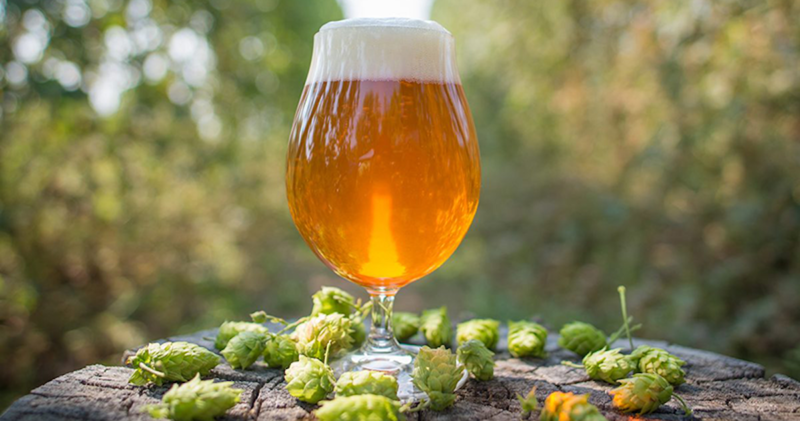 Because there are so many hop varietals and ways to incorporate them in the brewing process, there are many different beers and styles that can be classified as bitter and hoppy. Beers that fall under this category of hoppy and bitter beers have a fuller and bolder malt body rather than a super hoppy profile. Flavours of fruit with caramel-like characteristics are often present. Instead of in the flavour and mouthfeel of the beers, the hoppy notes are more vibrant in the aromatics of the brew. Beers that fall under this category of hoppy and bitter beers have a light malt profile and often come with a dryer finish. The hops used in the brewing process give earthy, grassy and woody flavours. Beers that fall under this category of hoppy and bitter beers are bold and intense. The strong hop flavours can give off notes of citrus, tropical fruits and sometimes even floral. The hop aroma will be the strongest characteristics in these brews. Hoppy and beers that are classified as bitter are usually paired with spicy foods. The hops balance out the spice of your dish. Pair hoppy beers with spicy Mexican or Indian dishes. Hops in beer also pair well with fatty and rich foods, such as fatty meats, fried food, and aged cheeses. The fat flavour calms the hop flavour. Bitter and hoppy beers are a great addition to any charcuterie board in the winter months, or a greasy burger and french fries on warmer days. If you’re ready to try some hoppy or bitter brews, you should start by trying beers that have similar flavours to ones you already know you love. If you like brussels sprouts, you might also like Alexander Keith’s India Pale Ale. If you choose to drink your coffee black, try a bottle of Cold Brew IPA by Rogue. If a bitter grapefruit is your favourite snack, you will probably like CitruSinenis Pale Ale brewed by Lagunitas Brewing Company. Since hoppy and bitter beers have become one of the biggest trends in the craft beer industry, there are a lot to choose from! Let us help you out by narrowing it down to some of our personal favourite hoppy and bitter beers brewed by Canadian brewing companies. Find the right beer for you! JustBeer has grouped all the styles of beers into six main beer profile categories to help you find beers based on flavours you already know and love. If you don’t understand those acronyms (ABV, IBU, SRM) and numbers on the side of your can? Here’s a quick lesson to get you in the know.